This page of the site is Under Construction. Below is the movies I will have available when the site is completed. Thank you for your patience. Jerry welcomes you to the official Sony.com site. George welcomes you to the official Sony.com site. Kramer tells Jerry about a monkey who threw a banana peel at him. George and Jerry talk about condom wrappers. 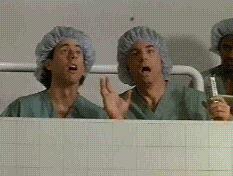 Jerry and Kramer drop a Junior Mint into an operating theatre. An advert from NBC for the Seinfeld Finale.